Discover Chichen Itza, a Mayan city with amazing vestiges of the one of the most important ancient cultures of the world, Visit the magical town of Valladolid and enjoy a relaxing experience while swimming in a cenote. A must-do for Cancun visitors! 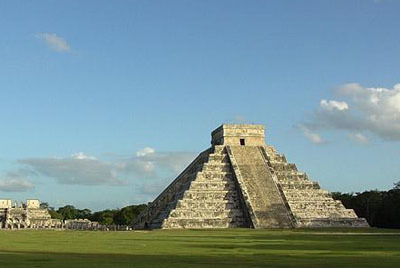 In this tour you will visit its spectacular temples and buildings that reveal an interesting history and a detailed astronomical precision like the Pyramid of Kukulcan, the Temple of the Warriors, the Observatory, the Ball Game, the Temple of the Skulls, among others. It is a beautiful colonial city founded on 1543 where you can admire buildings like Convent of San Bernardino of Siena and the Cathedral of San Gervasio. Valladolid charms those who walk in its streets adorned with colorful small houses. 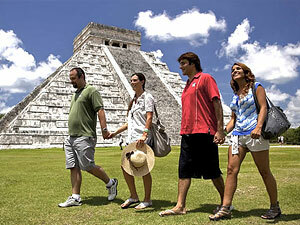 Pick-up time from 7:00 a.m.
On the way to chichen Itza and back we offer you unlimited drinks: water, soda, and beer. If you make the tour from Monday to Friday, the photomontage will be delivered physically towards the end of the tour. If you make the tour on Saturday or Sunday, we will send you your digital photo via email. Pick up is available in most of hotels in Cancun. Exact time of your pick-up will be sent by email after booking.